Dependability, durability, and value have made the Honda Civic a popular choice with Middletown and Newburgh drivers for quite some time. The 2013 Honda Civic builds on that reputation by adding some of its class’s best fuel economy, as well an excellent list of the standard features, including a rearview camera and Bluetooth handsfree calling. The 2013 Civic is available to test drive, lease, and purchase at Middletown Honda, but we realize you may be considering a few similar models. While there are many similarities, the similarly-priced 2013 Hyundai Elantra misses some of the key features that Civic drivers are enjoying. Here’s how the two models match-up. Upgrades to the system like satellite radio and navigation are also available. While the Hyundai Elantra has a similar starting price, features like Bluetooth connectivity and steering wheel-mounted audio controls are only optional. A rearview camera is also completely unavailable on the base, GLS level. It only becomes available at the higher, more expensive Limited trim level. 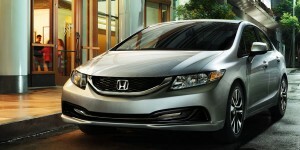 The best way to get a feel from the 2013 Civic is to take it out for a test drive. If you would like to set up a showing, contact Middletown Honda or simply stop in to our dealership. We’re located at 520 Route 211 in Middletown, just about 30 minutes west of Newburgh via 84. Our team looks forward to meeting you!